Giodelia, the Shoyru that led the way to the dungeon, offers to go with me. I refuse, not wanting to endanger the girl. I will fly to Meridell, complete my tasks there, and return to Fyora for the final ingredient. Should I tell her where I am going? My quest to find the ingredients for the potion to revive the princess should be known to the queen of faeries, but I am reluctant to tell her. In the end I decide against it. Fyora might insist on coming with me. I don’t want that. I feel like I need to be the one to do this. So I set out alone. It takes me the better part of the day to reach Meridell. Even after seeing Brightvale, I can’t help but gasp on seeing the castle. It is bigger than Brightvale’s, reminding me more of a fortress than a palace. I start walking in when a guard stops me. Have you ever had a brown Grarrl glaring down at you? It is not a pleasant feeling. “What is your purpose, child?” he growls. I take a step back. Somehow, I manage to stammer out that I am here to speak to Kayla, and then the king. He laughs when I mention the king. “Good luck seeing him in the next year, kid,” he laughs. He lets me pass, though. I find Kayla immediately. She is sitting at her little table, looking bored. She only has a few potions left. “What do you need?” she asks, lightening up at the sight of me, whom she deems a potential customer. When I am done she nods. “You must bring me a voidberry and a slorg for my potions. You will find these things at Meri Acres Farm. Now go,” she says. She lifts one finger to point at a place where a yellow Gelert stands alone. I thank her and go over to talk to the Gelert. “Pick some berries, miss?” he asks me with hope in his eyes. I nod eagerly. He hands me a basket and I give him 400 neopoints. I walk into the maze of a farm, berries everywhere. I grin as I see a black voidberry hanging just within my reach. I grab it and laugh. This is all so much easier than I thought it would be. Now for the slorg. I exit the farm and look around. There’s one! I run, trying to catch it. My paws slide around it. Yes! It worms its way out, though, and the chase is renewed. Suddenly I’m falling. I almost hit the ground by the time I remember I have wings. I fly up, up, up until I’m back to the farm. I really did fall a long way. If I hadn’t caught myself, I’d probably be dead. I remind myself that it isn’t the trip itself that has been dangerous, but rather my own carelessness. I have the slorg and the voidberry. I give them to Kayla and she hands me a little round bottle full of what looks like water. “Don’t tell King Skarl,” she whispers. And then she is gone. What was that all about? I shrug and walk over to the brown Grarrl. “You again?” he chuckles. I glare. “How do I request an audience with the king?” I ask. He isn’t chuckling now. He stares. “I told you before,” he says, “It will take you around a year. Everyone wants to see the king. You can make an appointment with her,” here he points to a starry Lenny, “but it will probably take you all day to talk to her, and then you’ll have to wait the minimum of a year to see the king.” I frown. Then I feel tears welling up in my eyes. Glissi needs to be better now. Not in a year. I run to the outside of the treasury. There is a Xweetok like me and Glissi acting as guard, but he is yellow. He looks young to have a job like this, maybe just a little older than me. I get down on my knees. “Please, oh please, give me three gold coins! That is all I need! Oh please, help!” Tears are streaming openly down my face now. He looks at me with pity in his eyes, as though he really wants to help but can’t. I unleash my story on him in much the same way I did with Starlittia back at the castle. When I am done, he just looks at me for a while. Then he starts talking. “I think I have a solution,” he says. And those words save me. I laugh and dance and sing. “Thank you, thank you, thank you!” I say, jumping up and down, until his voice brings me back to reality. “Don’t you want to know what it is?’ he asks. I nod feverishly. “I’ll make you a deal. But to understand, first I have to tell you my story. I was born in Brightvale, everyone says. I was brought here when I was seven. They trained me to serve in the army, be a guard, and protect my country. But it’s not my country. I want more than anything to go back to Brightvale. If you’d take me with you, I’d give you three gold coins. They are from my salary, and therefore from the king’s treasury. Please?” He looks at me as though I am his savior, which I find ironic, considering he is the one supposed to be saving me. “All right,” I say, and it is his turn to celebrate. “Mel,” I say, smiling at my good luck at finding someone who could help me. We prepare to leave at dawn the next morning. I sleep in a tree outside the castle. It reminds me of when I live in the forest. The forest. Do I still want to be Fyora’s assistant? The thought seems inviting, but so does the thought of the forest, the thought of Brightvale. Where do I want to be? Who do I want to be? Tri is going to meet me at my tree. Therefore, I am surprised to see him leaning against the castle wall. He lifts a finger to his lips, and I see what he is watching. Dozens of flying neopets are floating above us. Scorchios, Shoyrus, Eyries. And they are all equipped for battle. Dizzily, I wonder why they are here. “Don’t tell King Skarl,” Kayla had said. Is that what this is about? A formidable looking fire Scorchio, bigger than the rest, swoops down. “Hand over the potion,” he says, steel in his voice. I back away. Funny, this seems to be my response to a lot of situations. “What could you use it for?” I ask. “Can’t have the little princess getting better, now can we? King Skarl will soon be king of both lands, the most powerful ruler in Neopia! Then he may go on to conquer the rest of Neopia!” he yells. And that is when I know he doesn’t intend to just take the potion. He is going to lock up me, too. “How?” I ask. It is all I can manage at the moment. “No!” I am screaming now, for I know King Hagan will do just that. I bet he even placed the idea into Glissi’s head to go to the potion room, put a spell on her so she would drink. I’m not sure he counted on me, though. I run, holding tight to my potion, and grab Tri. I take off into the air and fly. I’m going to the forest. The king’s men shoot arrows at me, trying to knock me out of the air, maybe even kill me. I will not let this happen. Tri yells at me, asking where we are going. Tri. Of course he wouldn’t know that I was heading to my home. But I can’t tell him. I have to concentrate on flying. He’ll just have to trust me. I spot the tallest tree in the forest, the tree that marks where I should land. This is the center of our community. I land, dropping Tri, but still holding onto the potion. The faeries are eating breakfast. “Help!” I scream, and Prista and Listilla rush towards me. “No time to explain. Hide us!” I say, indicating my new friend and myself. Prista directs us into a hollow tree. We crouch there, waiting. Then we hear voices. “Have you seen two Xweetoks, perhaps holding a small bottle full of a clear liquid?” It is the voice of the fire Scorchio. Tri starts to open his mouth, but I cover it. “We have seen no such pets. Why would they come here? Leave at once. Your army is disturbing our meal.” This is the voice of Prista. I hear some grumbling from the Scorchio, but then I hear the wing beats of the army, flying away. When the last of the noises recedes, Tri and I climb out of our hiding spot. With a hasty farewell to Listilla and the other faeries, we leave. By the time we get to Brightvale, it is getting dark. I rush up to the castle guards. They recognize me from last time and let me pass. I walk down the hall to the throne room. We have passed over Meridell’s army’s camp on our way here. Thinking we were gone, they must have decided to wait until morning to approach Hagan. I run into Fyora. “Where have you been?” she asks. I can feel the indecision in her voice. She is trying to decide whether to be furious or not. 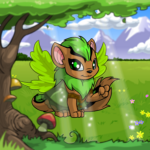 Fyora nods and hands me an apple. It would look quite normal if it weren’t for the sparkles that seem to surround it. “Thank you,” I say, and Tri and I race for the dungeons. There we find Starlittia and Brilla both. Brilla raises an eyebrow. I hand her the clear potion, the three gold pieces, and the everlasting apple. She throws them into a gold pot. It must be where she makes her potions. While she stirs, I tell her and Glissi everything that happened. When I get to the part about Skarl’s plot, Brilla jumps. “We must tell the king at once!” she screeches. I offer to go up, but in the end it is Tri who rushes up to explain. When he comes back down, Hagan and many other people who must want to see the unconscious princess or offer their help to Brilla and Starlittia walk behind him. I spot Giodelia among them. “Where is my daughter?” King Hagan shouts, his eyes scanning the room. Starlittia leads him to a room where Glissi is lying on a cot. She emerges, leaving the king with his child. “How much longer will it be?” Starlittia asks Brilla. I smile too. Soon everything will be perfect. Well, almost perfect. I still don’t know what I am going to do when this is all over. A white Uni bursts in. “The army is attacking. What shall I do?” She is shivering, poor thing. The Kougra bows and then walks out, a bunch of men and boys following him. Tri tries to go to, but I grab him and tell him to stay with us. He simply shrugs and stares at the potion. It has turned a beautiful silvery color. Pinkish mist is curling up from it and Brilla is grinning. Potion making. This must be what makes her happy. She grabs an empty bottle from a shelf and fills it with the antidote. Then she brings it into the room where Hagan is sitting with Glissi. Starlittia, Tri, and I follow. Brilla lifts the bottle to Glissi’s lips. As soon as it enters her mouth, the princess sits up and looks around. “What happened?” She is directing her question to me. I explain everything, with Hagan, Starlittia, Tri, and Brilla chiming in every once in a while. When I finish, Glissi smiles and thanks me. We leave her to rest. Fyora comes and tells me that King Hagan wants to see me. I follow her into the throne room. It is very crowded, with people talking and laughing. They all stop when they see me come in. “The Forest Daughter, Princess Melody of Brightvale,” someone announces. My heart stirs at these words. The Forest Daughter? Tri is smiling. Oh. He must have come up with that one. And they said I was of Brightvale. So this is my home now, I guess. Or is it? And princess! This shocks me most of all. How could it be? I faint, falling onto the cold marble floor. When I wake up, Hagan, Fyora, Glissi, Tri, and to my surprise, several earth faeries are crowded around my bed. I am wrapped in silk and velvet and lying upon a multitude of pillows. “Mel!” squeals Glissi, giving me a hug. Oh yeah. She is my little sister. Everyone agrees. I feel that I have made the right choice. It was a week ago that I made my decision, and now I am sitting with Starlittia, Glissi, and Tri. We are discussing the state of things in the castle, when I ask Tri what he has been doing lately. “You’re joking,” says Starlittia, laughing. “Trillsia? I should’ve known,” Glissi giggles. “Why didn’t you tell us sooner?” I ask, indignant. He should’ve told me, at least. “I-” He starts, but can’t finish, because just then a yellow Xweetok comes rushing in. “Hi, bro! Hi, Starlittia! Hi, Glissi! Oh, and I’m soooo happy to meet you, Mel! I’ve heard so much about you!” the girl says, bouncing on her toes. I figure this is Tri’s sister, Trillsia. In that moment I know for sure I have found where I belong. I am Mel, The Forest Daughter, Princess of Brightvale. Nothing could be more perfect.